The mission of Infinity Restoration is to provide top-quality commercial and residential, insurance-related restorative services in the Maryland and the District of Columbia metropolitan areas. Most importantly, Infinity manages an ongoing comprehensive quality control program to maintain 100% customer satisfaction. The company's principal officers view each contract as an agreement, not between a business and its customer, but between partners that wish to create a close and mutually beneficial relationship. The company has secured numerous strategic industry alliances in support of its mission. The alliances include sub-contractors, material and equipment suppliers, rental companies and industry associations. Infinity also acknowledges the importance of alliances with carriers and preferred vendor programs with insurance carriers and as such has entered into agreements with numerous insurance carriers. John Ellis, principal/owner of Infinity Restoration, is a well-known industry expert with over twenty-four years of experience in property restoration. John Is certified as an expert in construction with the Federal Court system and has acted as a witness in numerous cases in the State of Maryland throughout his career. He has participated in many significant restoration projects, in a hands-on capacity, as a production manager, estimator, and project coordinator. 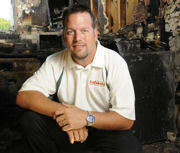 John has a thorough understanding of the restoration industry and construction. 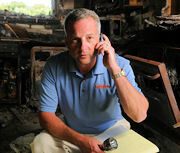 John has directed or managed hundreds of large fire and water losses over his career and as a result has developed extensive relationships with carriers, adjusters and sub-contractors in the Baltimore/Washington area. Wayne Odachowski, principal/owner of Infinity Restoration, possesses more than eighteen years of experience in construction, real estate development, and disaster recovery. Throughout his professional career Wayne has managed the development of numerous large scale projects – commercial, residential, public and private sector. Wayne has the knowledge and expertise to assess damage and address restoration techniques and procedures, as well as the project management skills required to conduct a quality, cost and time effective, recovery project. Wayne has a B.S. in Information Systems Management from the University of Maryland, an M.A. in Emergency and Disaster Management from the American Public University and is currently pursuing a Ph.D. from Northcentral University in Business Administration. Wayne is a member of the Restoration Industry Association’s Restoration Council and the Crawford Contractor Connection’s Contractor Forum.